An evening of top-quality entertainment – Michael Bruce’s unique repertoire was brought to life in sparkling renditions from the brightest and best performers of music theatre. I do love a cabaret. My first real steps into music theatre were at uni when I sang with Music Theatre Bristol over a very happy four years in the Mandela Bar. I’ve missed it ever since. There are many wonderful things about a full show, but there’s something great about the more low-key, unscripted intimacy of a small cabaret – not constrained by plot and instead getting to the point – showcasing fabulous songs. This evening had it all – numbers ranging from hilarious comedy to tearjerkers – along with the only-on-the-night mix of spectacular stage falls and intra-cast banter. We took our seats close enough to be at risk of getting black eyes from the guitar, and before long the 60-seater space of the Pheasantry was filled with a good-humoured appreciativeness for the sheer talent and passion on display. Michael Bruce is a young British composer whose work personifies almost everything that is right about new music theatre – his songs are beautiful and powerful, with a lot of laughs along the way. ‘Portrait of a Princess’, an irreverent (and explicit) take on the life of a Disney heroine (written especially for Julie Atherton) has become an internet sensation – if you haven’t seen it yet, you’re in for a treat: http://www.portraitofaprincess.com/ . Sadly Julie wasn’t there to perform due to illness, but the comedy song slots were more than adequately filled with the hilarious ‘I Want a Man’ and Helena Blackman’s rendition of the cheeky ‘This Christmas’. Yes, there were a couple of Christmas songs in June, but along with Stef Booth’s lovely performance of ‘Children’, they were of such good quality that the summery context didn’t matter at all. ‘Children’ won Bruce the Notes from New York competition in 2007 that kick-started his now booming career (he has recently written the score for Much Ado About Nothing starring David Tennant and Catherine Tate at Wyndham’s Theatre) – it’s almost too important to leave out, whatever the weather. Whilst the comedy songs were tantalising, Michael Bruce is no one-trick pony. Two performances from Paul Spicer – of ‘Even Then’ and ‘Unwritten Song’, were hugely emotional. The lyrics cut right to the quick, betraying far greater insight and maturity than one would expect of Bruce’s 27 years. Listening to ‘Unwritten Song’ – that gives his album both its name and final track, and was written for his mother who passed away last year, it would take a heart of stone not to be moved. Keep an eye on this one – I for one am extremely excited about watching his career develop. 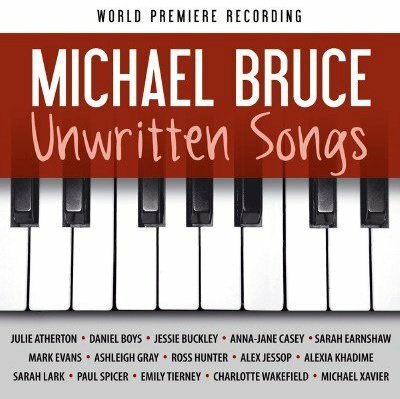 Michael Bruce’s debut album, ‘Unwritten Songs’ is available from Dress Circle, iTunes and Amazon.co.uk.